Who wants to do some freezer cooking?? So, at l-o-n-g last, I’m bringing back the “live-blogging” of Freezer Cooking today. I’m not sure exactly how this is going to go down and I’m going to have to find my new groove, but we’re just going to jump out and try it and we’ll figure it out as we go, okay? From 4:30 p.m. to 6:30 p.m. this afternoon/evening, I plan to do some Freezer Cooking and I’d love for you to join me! I’ll be doing some quick videos on as well as sharing some videos/pictures on SnapChat. And then, when I’m finished cooking, I’ll do a wrap-up post with pictures and details on Friday to let you know how the Freezer Cooking went. Want to join me? You can either just follow along vicariously by reading the post/watching the videos or you can actually join me in your kitchen and do some of your own freezer cooking. If you’re planning to do some freezer cooking yourself, leave a comment to let me know what you’ll be making. Let’s inspire one another and keep each other accountable! And I’ll see you over on Facebook Live/Snapchat at 4:30 p.m.-ish! I was just thinking last week how much I missed your freezer cooking in an hour posts I used to read…so happy to have them back and with the new fun way to view with fb live and snapchat. it’s perfect timing for me as my kids get ready to vacate the house a bit with school starting so I can bet back to my freezer cooking too! Have you ever thought about canning? I’ve been mulling over giving out a try. Crystal, I have to say – you seem like you are doing so well these days! I’ve read your blog off and on for years, but in the last year or two, you seem like you have turned a corner personally. You seem really carefree and relatable and just REAL, and I am enjoying it via your posts. And these “back in the kitchen” posts you’ve been doing lately are great. Seems like you are making the most of your year of rest and getting back to the things that really got you blogging in the first place. Anyway, just wanted to say that whatever has happened in your life in the last few years, it’s really working for you! You seem like you are in a really healthy, balanced, authentic place. Best to you and to your family! Thank you so much for these kind words! Your comment really made my day and blessed me! I’m so grateful that what I’m feeling in my heart is coming through in what I share online! I love this! I went overboard though with freezer cooking this summer and need to leave room for at least a gallon of milk so I can’t join you next week. Thankful for a full freezer, though, not complaining. Yay for a full freezer!! I just have to say that I’m really enjoying all your grocery-shopping and meal planning posts! I love that you’re getting back to what you really enjoy. I’m a newer reader (found out about you through a friend who took the Make Over Your Mornings course and texted me about it!) and I’ve really enjoyed following your journey over the past year and a half or so. I think your message about not having to do it all is so good and so needed!! Aw, thank you SO much for sharing! I’m so grateful! 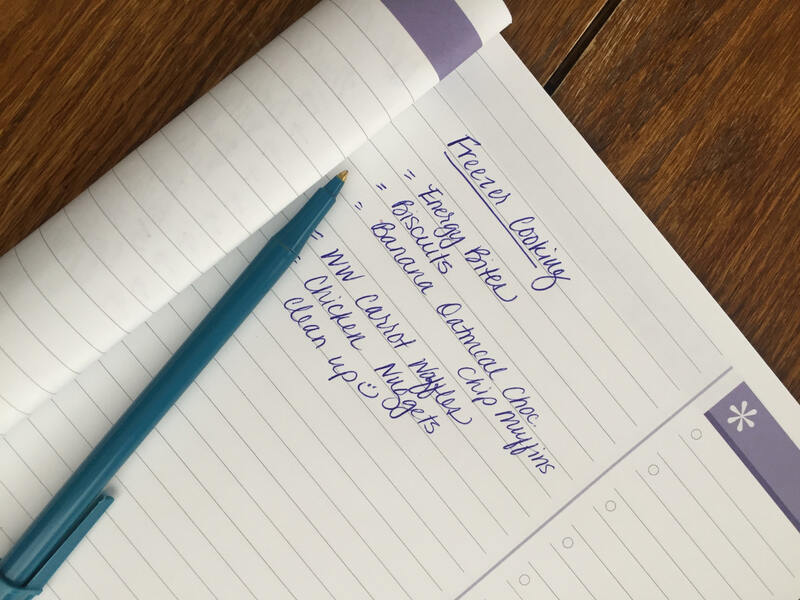 In one of the pictures in this post you have your list for freezer cooking-what is the notebook you’re using?! It looks like something I’d like to use! I use the kids’ spiral notebooks from years’ past and LOTS of notepads I make from scrap paper but there’s things I like to list and keep track of in a nice looking “book” 🙂 just thought I’d ask! Thanks! I will be doing my freezer cooking this weekend before kids head back to school next week. They have already asked if I can make your chocolate chip pumpkin muffins that they love so much. My son said can you make 2 batches so we have more in the freezer!